As a freelance writer who spends most of their working time writing content for web pages, I like to keep up with what’s going on over at Google, so that I can refine the service I offer as Google moves the goalposts. So I would like to share something I discovered today. In light of the Panda and Penguin updates, most website owners now understand that page quality counts. However, I am sure that many are not aware that it is not simply an automated algorithm which is scanning pages for shoddy content. Google is actively seeking out badly written content manually, and reducing its search impact. Google now employs a team of people who read web pages, and make judgments upon the quality of text found on the page, judgments that affect search rankings. Just look at the requirements here, the key facts being that pages need to be well written, compelling and entertaining to be rated highly. This means that keyword stuffed, shallow content, with little structure or body is going to begin being penalized in search rankings. 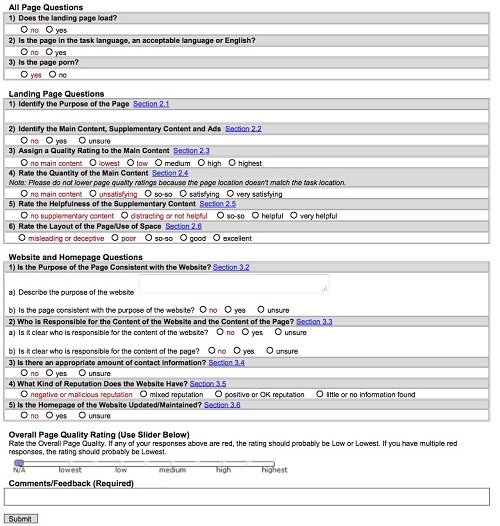 Check out the sections that ask the person rating the page to a) assign a quality rating to the main content, and b) rate the helpfulness of supplementary content. This means that Google staff are actually reading what is on the page of your website, and assigning it a rating based on the quality of the words on the page. Including how well written, informative and entertaining it is. What does this mean for webmasters? Well, it means that the days of buying cheap bulk content from overseas content mills, staffed by non-native English speakers with questionable writing ability, is becoming a thing of the past. Moving forward, you need to start thinking quality instead on quantity. This means proper content, which is well written, structured intelligently, and of value to website visitors. This entry was posted in Content Development, Content Marketing, Search Marketing and tagged Content Optimization, Content Promotion, Google, SEO. Bookmark the permalink.